There is a part of my drive into Manhattan that comes when I reach the high slope on the expressway as I arrive at Long Island City. This is when I have a total view of the New York City skyline, and for that moment, I am reminded of when I was young. I am reminded of the feelings I had, which pulsed through my body. 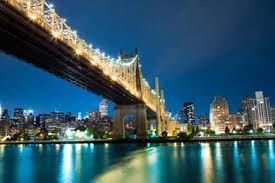 I remember the first time I drove over the 59th Street Bridge by myself. I was on my way in to meet a girl. There was no one else in the car but me. There were no wild friends of mine, drinking in the back seat, thanking me for being the “Sober guy,” and grateful that I was always willing to drive everyone home. I drove across the upper level of the bridge, which is the more scenic route to cross over the East Side River. It was a clear autumn night with a full moon. The lights from the city were bright and alive. The upwards glare from Midtown and the gleam from Times Square shined like a beacon of excitement. It was beautiful to me. There were shafts of electric light that stemmed into the nighttime sky from the from the heart of the city—or as it seemed to me—from the heart of a completely new world. The tops of tall buildings were dressed with red flashing lights to warn the low flying planes of their whereabouts. Below, the streets were alive with literally millions of people; all of them were going someplace and all of them went with something different to see. It was amazing to know that people lived here. There was culture and there was art. I felt something I had never felt before—I felt the desire to explore and become something other than who I was. I felt love for this city of mine. I felt a familiar affection, as if this trip I was one was a dream I had been through before. This is not to say that I was a stranger to the city by any means. I worked across from the Empire State Building in an small office on 33rd Street. I was a young salesman in a seemingly old man’s industry, which is why I was hired. The gentleman whose desk I sat behind retired at the age of 86. He wore old brown suits with yellowish buttoned down shirts and wide, brown ties. He wore black socks with brown orthopedic shoes. They were the kind of shoes with Velcro straps for easy fastening. And above all, the man I replaced smelled from the cream he used to solve his issues with psoriasis. In fact, when I was told, “This is your desk,” I sat down and I could literally smell the aroma of an old man, old coffee, and stale cigarettes. This was my first “Real” job and my first legitimate reason to wear a suit and tie. And though I felt uncomfortable, and though I looked like a kid in a suit instead of a man trying to earn his living—and though I struggled to find the right words to say or when to say them, I felt as if I was on my way to becoming something. I traveled to the city on a Monday through Friday basis. I made my way with the grown-up world as they headed to work with newspapers tucked beneath their arms, a briefcase in one hand, and a Styrofoam cup of coffee in the other. Each morning, I made my way to the nearby train station. I found a seat on the Long Island Railroad and rested before reaching my final destination at New York City’s Pennsylvania Station. Each night, I gathered like countless others in a crowd at Pennsylvania Station. I stood in front of a large screen to find my track—then I moved quickly to grab a seat for the train ride home. I was no stranger to the process of heading to the city. But this night was very different. This was my first time ever dating someone outside of my social influence or away from my circle of friends. The girl knew nothing about my background, other than I was a salesman, and I knew nothing about her. I knew that she worked for one of my customers. I knew she was pretty. She was older than me by four years, but yet, she looked much younger. The age difference was a concern for me. I was under the legal drinking age, which meant I was limited to where we could go on our date. My fake identification was poorly done and the idea of rejection from a bartender or a doorman to a bar seemed more humiliating than the difference in our age. My date had a southern accent. It was the kind that spoke politely at all times and it was nice to hear when we spoke on the phone. She was a secretary for moderately-sized, low-budget shirt manufacturer, but the job did not seem to match her character. Her direct boss was a wealthy, but middle-aged man. He was always rude to me in our exchanges, however, he was a longtime customer, so I never responded. He often yelled at my date, which was his secretary, but she never yelled back. My guess is she knew how to handle her boss. To the girl, my accent was strange. To her, New York was a strange place—but yet, there she was, living in an all-women’s boarding house in the Westside on 34th Street. There were no men allowed in the rooms or on any of the floors of the small apartment building. It was explained there were instances where some of the women tried to sneak men up to their rooms. In some cases, women in the boarding house even went so far as to dress their men in wigs and woman’s clothing. This seldom, if ever worked, and the end result was never good for the female tenant. Unfortunately for me or any man dating a girl in the building, men were not allowed anywhere passed the lobby. This meant at best, my date would only come to “Fit-for-public,” signs of affection with hopefully, an ending result of a long, slow, and hopefully passionate, goodnight kiss. I drove over the bridge and landed in the constant movement of Midtown. The lights from downtown, however, were less brilliant. There was a darker mystery to the downtown scene. There was something cooler about that side of town. I figured that would be the best place for us. The Downtown bars had a different feel to them. They were less concerned with things like wealthy dress codes, or more importantly, the places downtown would be less concerned with my lack of proper identification. Downtown seemed like the place to go, and like a switch to a light bulb, I recalled a diner on 9th Avenue just south of W12th Street. There was outdoor seating, which was perfect. The winds had only begun to lose its warmth from the summer months. The temperature was mild enough to walk the streets without the resounding chill of a post summer breeze. She kissed me with a quick kiss on the mouth. My car was far from spectacular. It was a beat up, four-door, blue Chevy. The headliner was sagging in spots. The engine was loud and rumbling, but it was a car and it took me from one place to another. The heat worked and so did the air-conditioning, but more importantly, so did the radio. The backseat was large enough, and while yes, the car was nothing to brag about; I did have my share of moments in that backseat. We headed to the diner on 9th. I could see the girl looking around my car with a sort of, half-smile. “My father gave me his old Caprice,” she said. There came a time when the conversation became easier. Maybe it was the surroundings. Maybe I felt more comfortable and saw her as less intimidating. Maybe it was the overweight transvestite that pedaled around on an old bicycle while dragging a large cart behind it and sang to those who were eating at the outside seats at the diner on 9th Avenue. Or maybe it was the amount of wine she drank. My girl was speaking and the surrounding was perfect. We were at an outside table for two with a white tablecloth. I felt cool in the coolest way possible. The light from the nearby streetlamps seemed to glimmer in her eye. It was enough to open my thoughts to a more physical or romantic connection. She appeared so wonderfully wholesome and innocent. I tried to listen as she spoke, but I was drawn in to her teasing looks. I was drawn to her soft features and my focus was caught by the opening of her v-cut top. “Anyway, I need the job,” she explained. We ordered food and she ordered another glass of wine. After the salad, she placed her fork down, and placed her hands in her lap. Then she exhaled with a kind smile. “It’s not a problem,” I answered. “I’m not that easy.” I told her. We talked for a while longer before the dishes came. I admit, I wondered what would happen after the meal. I wondered if that exchange was her way of telling me she was not interested, or if this was a shy, sort of cool way of telling me that she is. The subject of work resurfaced. Perhaps the wine loosened her tongue a bit more than I expected, but she began to speak freely. She began to express her disgust with her boss, and suddenly, her kind, southern accent, turned into something hard and less wholesome. She began to curse, which was unlike any conversation I ever had with her. She ranted on about her boss and the way he dressed. She complained about the way he looked at her and the way he spoke to her. Occasionally, she made a suggestion as if she was interested in me. But as her tolerance for wine had reached its limit, my date’s voice became louder and her speech began to slur. “He literally complains ALL DAY LONG!” she told me. “Yeah, but you’re not like the rest of them,” she said. She lifted her glass to down the last of her white wine. “What was your last job,” I asked. The night tumbled after this. The wine took her for a spin and I drove her home before that spin decided to reverse itself. Nothing interesting happened in the car ride back to 34th Street, although her shirt did seem to open up a little wider when she complained how hot it was in the car. “Don’t feel bad,” she told me. She did apologize. Then she asked me to call her when I reached home. “I’ll give you a little sample on the phone,” she promised. I drove home with my pride in a rage. I swore that I would never take her out again. I even considered removing her company from my account list. I swore the girl off. “I’m not calling her when I get home,” I told myself. I promised myself this several times . . . until I reached my bedroom, of course. Sometimes . . . certain promises are made to be broken.